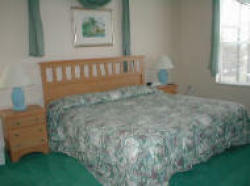 Completed in 2002, our luxurious house is fully furnished to a high standard for occupancy by up to 12/14 people. Spacious air conditioned accommodation comprises: six bedrooms � 4 � bathrooms; 2 Master bedrooms (en-suite) with king-size beds, 1 bedroom with double bed, and 3 with twin beds, 3 living rooms, separate dining room, living room, breakfast kitchen, laundry room, and double garage. 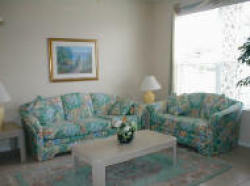 Patio doors lead from the family room onto extended sundeck with sun lounges and patio furniture. 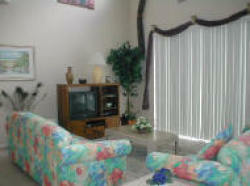 Fully screened patio with heated pool and power spa enjoys privacy and has the most superb view across the lake. Come and enjoy the wildlife, tropical plants and chill out with a gin and tonic in the delightful bathwater spa where you will we able to see the Disney fireworks���yes we are that close!!!! Ammenities: Tennis table, Football table, Playstation 2, Security system, intercom system, cable TVs, VCRs, telephone, ice maker, cold water dispenser, dishwasher, fridge/ freezer, washing machine, dryer and much more. Emerald Island is a private gated community set admidst 11 acres of woodland. It has a clubhouse which offers: community pool, Tikki bar, kiddies play area, games room, picnic area, cyber caf�, lighted tennis and volleyball courts, nature trails and picnic areas.